This logo is not available for sale anymore. Please browse our other logos. Make a logo design in minutes. Try it for FREE! Make a logo you'll love, instantly. Try for free. Whether you need logos for your startup, a real estate business or a wedding, we can help you generate thousands of logos in seconds. Want that dream logo for your business? Want it to be the cream of the crop, the crème de la crème and elevate you above competitors? Then you're in the right place. Our logo maker lets you generate thousands of logos from a professionally designed library in seconds. You can then customise the logos for free - who doesn't like the sound of that? We know starts-ups, entrepreneurs and new businesses are all short on time - in fact who isn't? We also know that you want a tool that's not just free to use, but super simple to use. that's why we've spent many long hours perfecting our logo maker, so you can get the job done and get the perfect logo in minutes. Now you've created your new logo it's time to put it to good use. Don't miss the opportunity to get matching social media pics, banners and covers. 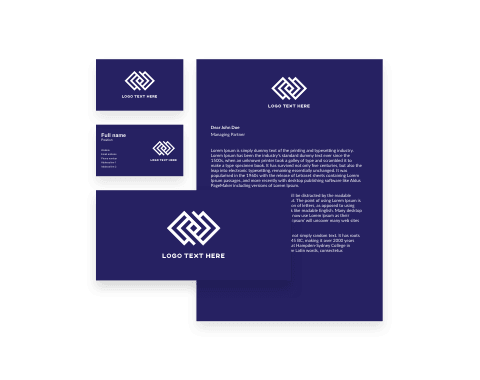 Then plaster your new logo on business cards, envelopes and letterheads. We can also get your matching merch, office supplies and stationery printed - making BrandCrowd the one-stop-shop for launching your business. Make your dream logo - in minutes! Why should you use BrandCrowd Logo Maker to create your logo? Unlike other logo makers that use stock icons, our 10,000+ designs have all been handcrafted by a community of top designers. Get a stunning logo - always! BrandCrowd Logo Maker is free to use. Browse thousands of different logo designs, edit and save as many as you like. Pick a design you like and start editing it. In minutes you can make a logo you will love. I find no way to make it better - it was exceptional. Our logo came out amazing! I will be ordering many more things from your business. Exceeded our expectations! Thank you! My logo necessity was extremely obscure, yet you had exactly one logo that would actually do. Thank you for being forward thinking! What is the BrandCrowd logo maker? Only the most awesome logo maker tool every made! But seriously, our logo maker allows you to easily generate thousands of logo ideas by simply entering your business name. You can then further customize the logo, colors, fonts, layout using our free to try, easy-to-use logo maker tool. With a few quick clicks and zero design skill you can create a logo you love. Can I request changes and revisions? Yes! On the logo editor, you have an option to request changes to your logo. If you require more complex changes, we offer the option to work directly with one of our in-house designers to get you the perfect logo. Simply purchase our Senior Designer add-on. I need a lot of different logo sizes and file formats, do I get those? Can I get full copyright ownership for my logo on BrandCrowd? For 'standard' logo purchases we will grant you a worldwide, irrevocable license to use your logo for any commercial and non-commercial purpose. If you buy an 'exclusive licence' the designer will transfer any copyright that exists for the logo. The logo will be automatically removed from the site.